Larry Ellison was interviewed this week and he proudly called the America's Cup boats the fastest in the world being sailed by the best sailors in the world. Before the series started, I predicted here and here that the America's Cup could be won by the team that does not have a major problem. 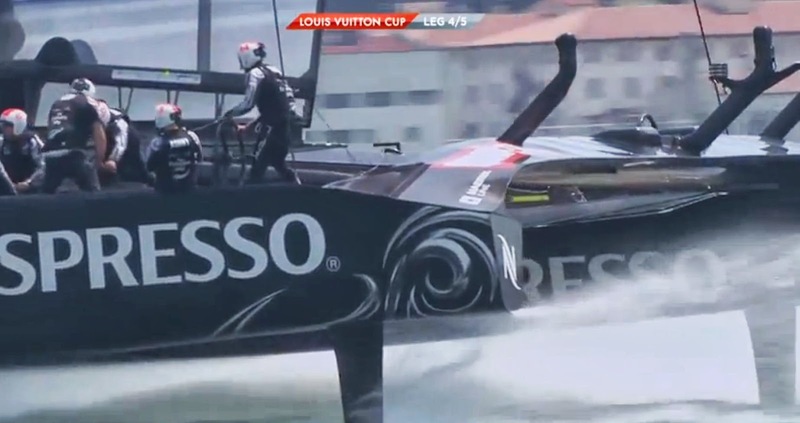 In the Louis Vuitton final, the first three races have been won because the other boat failed to finish. Let's hope my prediction does not continue to be correct. So far, the total lack of tactics and winning margins of minutes (when a second boat is able to finish) makes it pretty boring even for sailors. Australia put its winner in a museum, but it's safe to say that this year's winner will not fit in a museum. While you can still see 12-meters being sailed on Newport and Sydney harbors, it's unlikely that any of the AC72's will ever be sailed again (hey team, let's rig up and go for a sail... who's got a 150' crane?) So they'll be mothballed after the series is finished. In the interview, Larry Ellison admitted his disappointment from the lack of competitors. He even mentioned a preference for a return to the AC45's next time around. So it's easy to get a little cynical about the current series, the financial bath that San Francisco is taking, and especially the death of Bart Simpson. So where is the positive? This is a very special moment in sailing history because we may not see anything like these boats again. It's a once-in-a-lifetime pinnacle in our sport, so enjoy because they're probably not coming back. An unbelievable sight of the team I think will easily win the Cup. I think you are right that we may not see AC72s again. But I think the next iteration of the AC might well be in a similar design but not quite so huge and expensive. Perhaps a 55-60 foot foiling cat with a wing sail. Money is certainly a big part of it. In the interview, Ellison was asked if $100 million is too much to spend winning the Cup. His answer was that $100 million is certainly too much to spend losing the Cup. If a guy worth $43 billion complains about cost, you can imagine how other teams (and potential teams) most feel! The AC72s are too big today much like the J-Class boats were too big for the 1930s. AC history tends to repeat itself if you can stay awake long enough for it to register. But J-Class boats are still racing 80 years later. I think Doug's right. 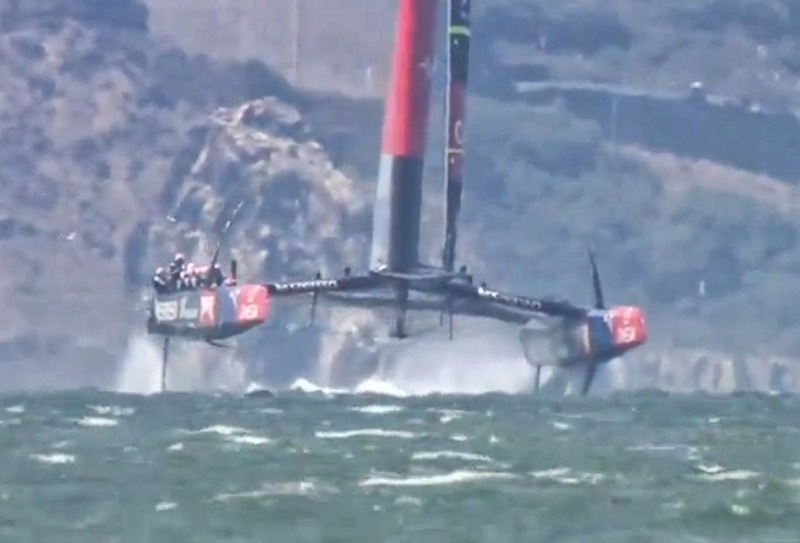 The AC72s probably won't race again, and certainly won't still be racing 80 years from now. 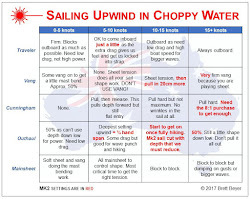 Also, Doug correctly highlights a real problem for wing sails, even for smaller boats - you can't furl, roll, fold or otherwise make them manageable with the mast remaining in place. As cool as they are, the logistics of dealing with wings will be a real challenge. The AC72 is a spectacle and a marvel on it's own. However, put it on a racetrack and it's a real yawn. Sheesh, even the pre-start manoeuvring is practically non existent, and is the closest they are going to get. As you said Doug, the lack of tactics makes for very boring viewing. What to do to fix the AC in the future? Maybe the AC needs something like a 35-40 foot skiff, sort of like a grown up 49er, no weighted keel allowed, just centreboards and foils and any number of crew. Allow water ballasting systems only, so give them the ability to move this water ballast around. I can imagine these boats would inject plenty of excitement, speed AND tactics, and what a spectacle they would be! There would be no shortage of challengers either and the best sailors in the world would really be able to shine. Agreed, and the last race of the Louis Vuitton today just proves the point. Frank and Julian were working on a giant 49er that sounds a lot like what you describe. It may have been too expensive for the mass market but could work as an AC boat for sure. It would be great to have a class where you can't just buy your way to the top. Let those rich guys buy Lasers and do slalom courses in front of St. Francis Yacht Club. 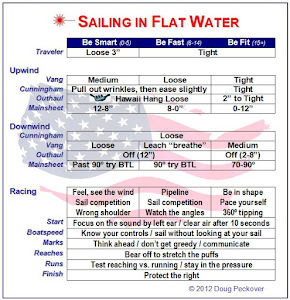 But that would require them to get in shape, learn the rules, learn boat handling, be gracious about losing, etc. etc. 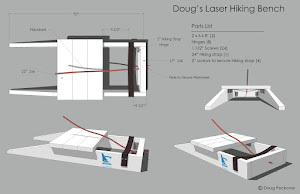 What I love about sailing Lasers is that it's the great equalizer - no one can buy their way to the top. A great example of this was at the 2000 Open Worlds in Cancun where a fellow from Poland showed up without the right equipment. I remember stories of people lending him things so that he could compete. Incredibly, he finished 7th in the gold fleet! Huge skill without any money... it was great to watch. I stand corrected. 3 of the 4 races so far have been riveting. Speed, tactics, drama, and more speed. It's a shame it took so long for real racing to emerge, but its great stuff at the moment. Kiwis will win, but aoracle will keep them very honest.